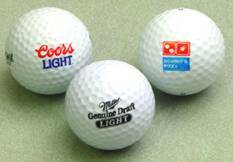 Custom Imprinted Golf Balls, Promotional, Customized, Printed, Personalized. Display & Price Page - Custom Imprinted Golf Balls produced quickly at amazing low prices! Imprinted golf balls with your logo, business name, or business message are the most cost effective customized golf balls your money can buy! And your message, as part of your customized golf balls, will be exposing your business, and or organization name, or logo 24 hours a day, seven days a week for months, sometimes for years. Watch your ad message to soar as you put it on these customized golf balls to promote your company name, products, or services. These customized items are very effective advertisers for your business, organization, golf courses, golf tournaments, training schools, colleges and universities, business schools, all type of sport teams, trade shows, recreational areas, vacation resorts; state, city, county fairs, travel agencies, etc. They present a fantastic opportunity to identify your business, or organization as a winner in your community. We customize well known brand names in the industry such as Titleist, Wilson, Nike and Pinnacle. For more details, to locate item number and prices, click on any of our links in this page. These spectacular customized golf balls will help you to meet your advertising goals. And the best of it is that you will have them cheering all game with these high quality printed items. These customized golf balls are sold in minimum quantities of 144 pieces (12 Dz) imprinted with your message or logo in one or more colors, one side. Also, we can imprint your logo or an additional message on the second side of these golf balls. For additional charges, details, and to place your order, click the link at the bottom of this page. Also, we imprint logos and business messages on golf tees, markers, fixers, and golf gift packs, and golf gift bags to fit every need and budget! In addition, the custom imprinted golf bag tags we provide are super thick durable vinyl. These tags are great for golf outings, country clubs, product identity, sales meetings, conventions, corporate trips, travel agencies and many other uses. Furthermore, we can also provide you with various blank sports balls (no imprint), at blank cost. Blank items are usually shipped within 2-4 working days from the time we receive your complete order. NOTE: Colors, quantities, brand names, prices, material weight, styles, and sizes are subject to change without notice. For complete advertising, promotional, and customized item information, artwork requirements, print size, ink colors, order forms, and many other sports ball ideas and styles available, click any of the links at the bottom of this page. Tees: Available as individual tees, bulk packs, multiple tee packs; and or mixed packs of markers, divot fixers and tees. For every budget, there is a Tee pack available ! With your company logo, business name or message, these high quality - long lasting Golf Balls can be, as you desire, custom imprinted. High Quality - Sports Towels for all your events: Heavy, medium, and ultra plush heavy weight. Five sizes and styles. A wide variety of embroidered and screen printed Sports Towels. For more Promotional & Custom Imprinted Products at amazing low prices, click here. Advertising Specialties produced quickly & at low prices, click here. To make your selection from the golf product display page, and to place your order, click here. Then follow the instructions in the ordering form for each page, or call us at the telephone number at the bottom of each product page and order by phone. For rush services, please inquire. RUSH service is available up to 100 dozens golf balls, imprinted one color, one location . Please call for prices & availability of this service. All Rush orders, camera ready & approved artwork must be completely received by 10:00 AM EST in order to process them. NO EXCEPTIONS. EMAIL your questions, inquiries, purchasing oreder, and artwork to: Customer Service.